Hello all! Nanette here. 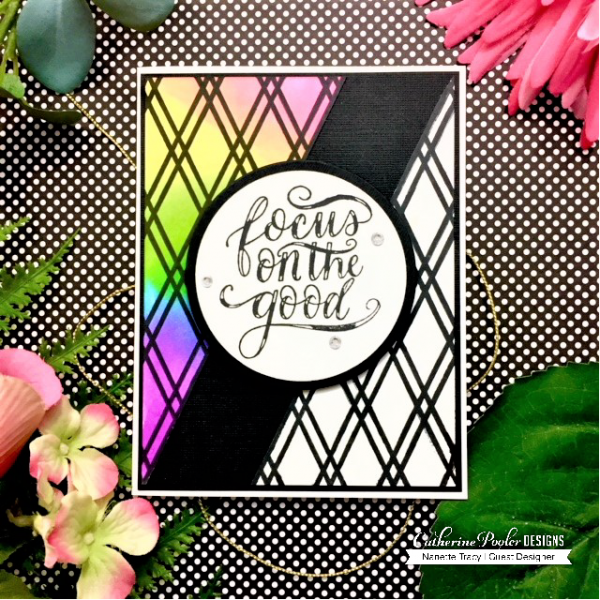 I’m so excited and honored to be on Catherine’s blog today featuring some fun-to-make cards that I created using supplies from the Wild and Wonderful Collection by Catherine Pooler Designs! The projects I am featuring today are un-“mistake”-able. In other words, these cards are made from my mistakes. The inks I used for all three cards are from Catherine’s Life of the Party Collection along with Grape Crush and Limoncello. Plus, of course, my all-time-go-to ink, Midnight. I had first masked, with Purple Tape, in a diagonal on to my white card panel and blended the inks on the left half. After that, I stamped the BFF Background stamp in Midnight. Then—mistake number one—I had taped off my design in a slightly askew manner, thus making it necessary to cut the entire middle of the card from corner to corner off. This created one blended corner and one black and white corner, which I adhered to a Midnight card panel. Then I used the Circle dies to create the framed sentiment. The sentiment is from the Focus on the Good Stamp Set and adhered with some dimensional adhesive foam. I finished it all off with a few rhinestones. 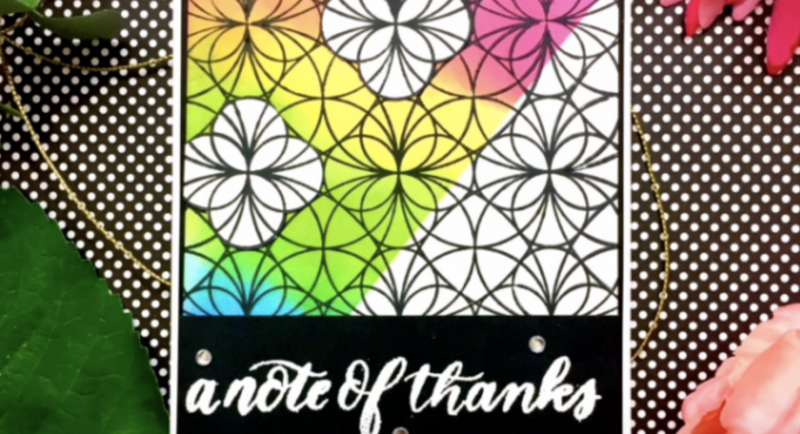 On Midnight cardstock, I white heat embossed the sentiment from A Note of Thanks Stamp Set, trimmed it down to fit the panel, adhered it with dimensional adhesive foam and added a few rhinestones. Awww… You’ve heard it all before… Blend, stamp, smear and smudge. Then just cut out the remainder of the pattern in a single, amazingly un-smudged row and adhere it to a white card panel. The black layer is the Postage Die from Love is in the Air Stamp of Approval Collection. 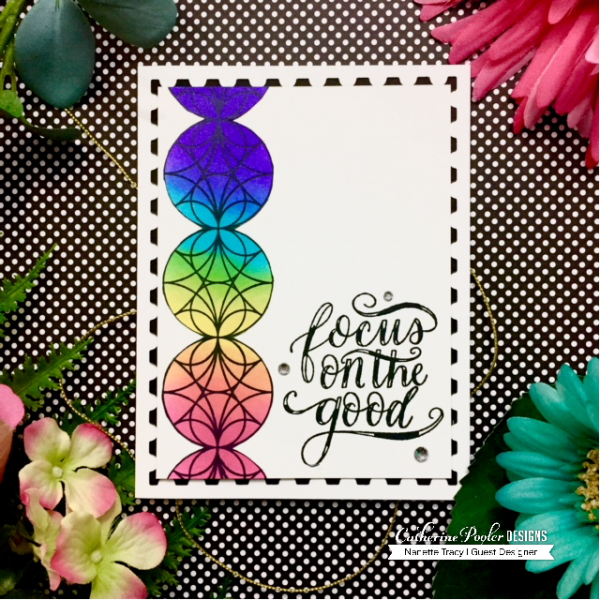 I stamped the sentiment from the Focus on the Good Stamp Set and added a few rhinestones. I have created multiple cards with the Wild and Wonderful Collection and still have dozens of new ideas to make with this set! I love it and know you will, too. We’d love to see your creations, so be sure and show us what you’ve got!